May 9, 2011 - Embraer Defense and Security has selected Rockwell Collins to provide its Pro Line Fusion flight deck for the KC-390 tanker/transport aircraft. The Brazilian Air Force has committed to purchasing 28 KC-390 aircraft. “This award is emblematic of our ability to leverage commercial avionics technology for military applications,” said Dave Nieuwsma, vice president and general manager of Mobility and Rotary Wing Solutions for Rockwell Collins. The KC-390 avionics system features key technology advancements and smart integration that provide flexibility and growth to meet future challenges. An empowering human interface helps pilots unleash the full power of the system, providing extensive situational awareness for enhanced decision-making. Operational efficiencies are improved because the pilot receives the right information at the right time. “Strategically, this award means a great deal to Rockwell Collins as it builds upon more than 35 years of serving the rapidly growing Brazilian military and civil aviation industry, including the very strong relationship we’ve built with Embraer,” said LeAnn Ridgeway, vice president and managing director, Americas, Rockwell Collins International & Service Solutions. Standard features on the KC-390 flight deck include: five high-resolution 15-inch diagonal Liquid Crystal Displays (LCD), Integrated Flight Information Systems (IFIS) with electronic charts and enhanced maps, advanced Flight Management Systems (FMS) with Wide Area Augmentation System that supports Localizer Performance with Vertical guidance approaches (WAAS/LPV) and Required Navigation Performance (RNP) capabilities, advanced graphical flight planning capability, and an Information Management System (IMS) to manage databases and facilitate wireless interactivity with the ground infrastructure. Rockwell Collins continues to build on its strong tradition of success providing integrated avionics solutions for military aircraft programs. By leveraging key avionics and communications developments across the company’s commercial and military businesses and applying commercial off-the-shelf technology along with an open systems approach, Rockwell Collins is able to provide its customers with best value solutions. 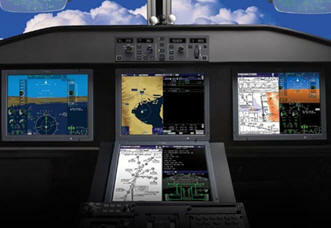 Rockwell Collins is a pioneer in the development and deployment of innovative communication and aviation electronic solutions for both commercial and government applications. Their expertise in flight deck avionics, cabin electronics, mission communications, information management and simulation and training is delivered by 20,000 employees, and a global service and support network that crosses 27 countries.